Afghanistan 'Not Worth It' To 64% In New Survey : It's All Politics A new Washington Post-ABC News survey strongly suggested that President Obama's time to fix Afghanistan is fast running out. Now 64 percent of those polled say the war isn't worth it while 31 percent said it was. In 2007, it was 56 percent in the "worth it" category versus 41 percent. 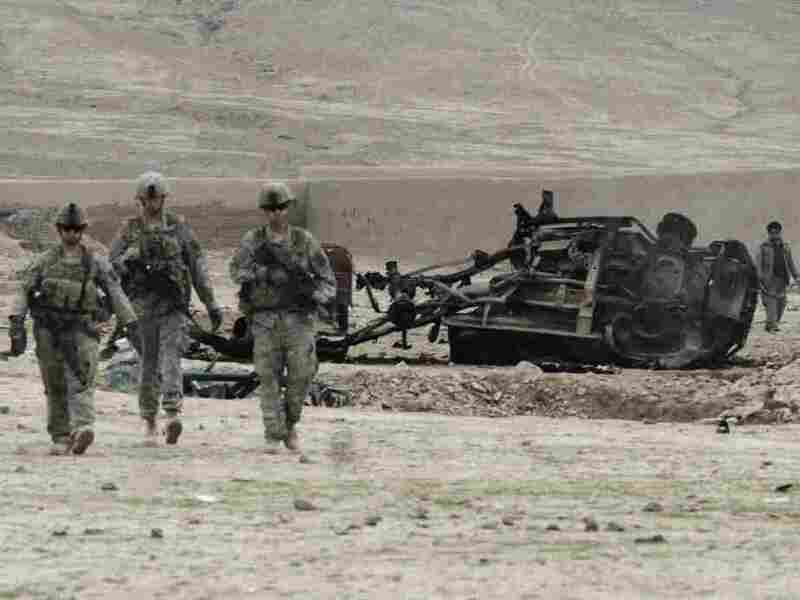 U.S. soldiers pass car wreckage after an explosion in Kandahar province, Afghanistan, February 2011. If there's any good news for President Obama in the latest ABC News-Washington Post poll in terms of the questions the pollsters asked about Afghanistan, it's that most of those surveyed — 53 percent — didn't think the president would withdraw a "substantial" number of U.S. troops this summer. Obama has indicated that he intends only small withdrawals of troops this summer, so the public expectation lines up with his plans. So far, so good. But the rest of the poll's Afghanistan responses are dismal news for the president. The poll reports, for instance, that 64 percent of those surveyed in March thought the war not worth fighting. That's slightly higher than the 60 percent who said the same in December but the trend is all in the wrong direction. Looked at another way, only 31 percent said the war was worth waging. Compare that with the 56 percent who said the same thing in May of 2007. The bottom has clearly fallen out of support for U.S. troops in Afghanistan. In democracies, leaders generally run into problems when they attempt to sustain war efforts that lack popular backing. Obama has undoubtedly gotten leeway from voters because he inherited the war along with Iraq. And he campaigned on sending additional troops to Iraq. Meanwhile, Gen. David Petraeus, perhaps the military officer best known and most trusted by the public and who testified Tuesday on Capitol Hill, has been running the war of late. That, no doubt, has bought the president's Afghanistan surge strategy some time. But these numbers certainly don't suggest the president has as much time politically as Afghanistan might require, especially as Americans consider the costs of the war in lives and money.